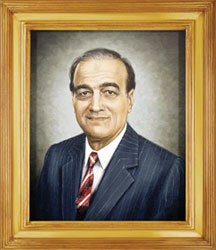 Mir Khalil-ur-Rahman, founder of the hugely-circulated Jang Group of newspapers, is a legend in Pakistan. A self-made newspaper magnate Mir saheb ranks among the most successful newspaper entrepreneurs in Asia. He was born in 1927 to a middle class family in the town of Gujranwala, Punjab and received his school and college education there. Having finished his basic education, he graduated in Accountancy from Punjab University. 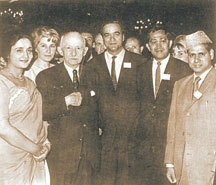 During the Second World War, his parents shifted to New Delhi, capital of the British Indian Empire. It was here that he discovered his love for journalism. The newspaper world attracted him far more than the dull books of accountancy. He had a passion for reading and writing and a fondness for newspapers and magazines. He sat glued to his radio set, listening to the latest war news. Mir saheb could have joined the British Indian Army but his hero and leader was the Quaid-i-Azam Mohammad Ali Jinnah, so he joined the Quaid's Muslim League whose goal was the creation of a Muslim majority state in the Indian subcontinent. In his efforts to contribute towards the fulfillment of this goal Mir saheb despite the shortage of funds began publishing Jang as a daily evening newspaper in Urdu, the most popular language among the Muslim masses in India. To keep the Jang's production cost very low and to ensure a big circulation for it he sold his newspaper at a paisa per copy. With time the circulation increased and he sold 3000 copies of his newspaper per day and made the Jang self-supporting. Mir Khalil-ur-Rahman was able to leash the expenses of publishing the Jang to the barest minimum by doing many chores of newspaper himself including editing, composing and reporting. He even cycled scores of miles to deliver copies of the Jang to the hawkers and advertisers. One of the merits of the Jang was its copious coverage of the latest news from all parts of the globe, especially the war fronts in Europe, Asia and Africa. He listened to the news broadcasts from many countries and lost no time in injecting these news stories into the columns of the Jang. The heavy coverage it gave to the news of Muslim interest and the fearless manner in which it purveyed news of injustices done to Muslims increased its popularity among the Muslim masses. The Jang began wielding influence in the corridors of power in New Delhi. But as the graph of its popularity and readership rose, its enemies in the Hindu-dominated Congress became more hostile. Mir Khalil-ur-Rahman was not frightened by their intrigues and countered them fearlessly. 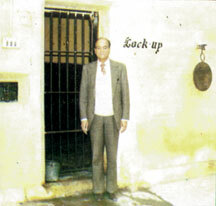 Denial of Government advertisements, slashing the newsprint quota and instructing the government-dominated banks not to lend money to the Jang were some of the coercive measures which Hindu cronies in the Government, especially in the provincial government of the Congress in Uttar Pradesh employed to muzzle the Jang, but Mir saheb remained defiant. Mir saheb appealed to his colleagues in the Muslim-owned newspapers in India to unite and face the Congress onslaught bravely. He mobilised them to set up an organisation of Muslim owned newspapers in India. 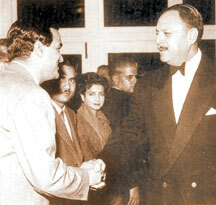 In the India-wide General Elections of 1945-46, the Jang gave all-out support to the Muslim League. In this regard Quaid-i-Azam Mohammad Ali Jinnah was immensely pleased with Mir saheb and the efforts of the Jang. Mir Khalil-ur-Rahman sought no financial help from the Muslim League for the Jang's fearless support to the Muslim League in the national polls and because of the Muslim League's victory in the elections, the British rulers conceded its demand for Pakistan. When the Muslim-majority State of Pakistan was established on August 14, 1947, Mir saheb shifted to Karachi, capital of the new Muslim State, and started publishing the daily Jang from Karachi. Pakistan's Governor General, Quaid-i-Azam Mohammad Ali Jinnah was delighted due to this move and offered government's help in running it. Mir saheb however, declined the offer saying that freedom of the press was his motto and goal for the Fourth pillar of State in Pakistan. 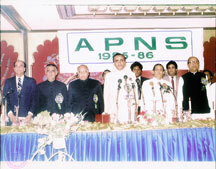 Mir saheb galvanised the press in Pakistan and helped in founding the Council of Pakistan Newspapers Editors (CPNE). He opposed tooth and nail any Government measure or action which curbed the freedom of the press in Pakistan. Mir saheb paid the salaries of the Jang's staff on the first of the month and also gave a string of benefits to his staff such as medical, transport and housing allowances. Working conditions in the Jang were considered as a model to emulate by workers in other newspapers. He showered benefits not only on the Jang's press employees but helped in diverse ways the Jang's hawkers in Karachi and outside. He considered the hawkers to be a vital force in the newspaper industry and therefore believed that their needs should be given full attention by the newspaper's management. Mir saheb went to the extent of even bearing the marriage expenses of a loyal hawker of the Jang once. Mir saheb's practice of giving substantial prizes to the winners of Urdu puzzles in the Jang increased its sale and many other newspapers followed suit. In the Urdu journalistic world the Jang Group was the first in Pakistan to switch over to the computerised typesetting with the Noori Nastaliq style of calligraphy as its base. skyrocket and Goss rotary machines would be essential for his popular newspapers. Mir saheb's newspapers were nurseries for training competent journalists who earned named and fame through their writings in the Jang newspapers. Mir saheb was a man of the masses and conducted himself with dignity in the meetings of renowned editors in the USA and the UK. He secured many overseas scholarships for his Pakistani staff members in the USA and the UK and got them internships in many famous foreign newspapers and media organisations. 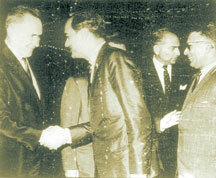 Likewise, when foreign media delegations visited Pakistan, Mir saheb and his newspapers lavished hospitality on them. Keeping up with technological progress he put many of his newspapers on the internet and personally directed the making of websites for each one of his newspapers. To further improve the quality of his newspaper he allowed some well known foreign journalists to work in his organisation. Some of them even wanted to get first hand knowledge about the working conditions in the Pakistani press. Mir saheb's Jang in London is very popular and very useful for projecting the viewpoint of Pakistan. It is in my knowledge that officers on the Pakistan desk of the British Foreign office regularly read English translations of news items and commentaries in the Urdu Jang of London. I have also had the good fortune of traveling with Mir Khalil-ur-Rahman in a dozen Pakistani Government delegations during which I was able to see at close quarters the many qualities of head and heart which made Mir saheb so unique in the journalistic fraternity of Pakistan. 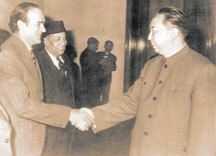 In the summer of 1956 we traveled together to the People's Republic of China as the guests of the Chinese Government. On this trip our Chinese aircraft had to make an emergency landing in the Gobi desert. We were informed by our Chinese hosts that the radiation of heat in the desert was very high and that after midnight the mercury would drop very rapidly. Therefore, each one of us was given a heavy duty blanket. The senior-most member of our group was the aged Maulana Akhter Ali Khan, Editor of the Urdu daily Zamindar of Lahore. He was suffering from a nasty cold which raised his body temperature. Mir saheb took his own blanket and spread it on Maulana Akhter Ali Khan who was resting at one side. He then arranged for some hot tea to be given to Maulana Akhter Ali Khan who had been examined at midnight by a Chinese Air Force doctor. Mir saheb' s care at this occasion is commendable as he paid fraternal attention to the patient so much so that by the next afternoon he was able to move about normally. In a meeting of editors with President Ayub Khan in Rawalpindi late in 1956, Mir Khalil-ur-Rahman boldly asked the President when he would lift martial law and install an elected civilian Government as promised earlier. But, as President Ayub did not like being reminded about the promise he had made to the nation at the time of seizing power, he replied ambiguously in an angry tone. On this occasion some members of the bureaucracy tried to persuade Mir saheb not to pursue his question and offer an apology to the President but he refused to do so and pressed for a reply to this question. He was not afraid of the high and mighty and forcefully upheld the right of a journalist to elicit information that would be of interest to the newspaper readers. At another instance in Beijing, we attended a press conference addressed by Prime Minister Chou en Lai. There, Mir saheb quickly wrote a detailed story about it and personally delivered it to the cable and wireless office in Beijing for immediate transmission to the Jang in Karachi. 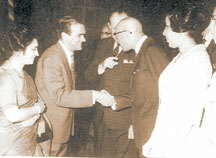 Mir saheb was extremely well-mannered in his interviews with foreign heads of state. All through our travels in China Mir saheb made it a point to meet the local Chinese journalists and gather information about the Chinese newspapers and their relationship with their Government and the bureaucracy. During our visit to China, we also saw the historic city of Urumchi in Muslim-majority Sinkiang. Mir saheb arranged for the Pakistani press delegation to offer the Friday prayers in a beautiful 500-year-old mosque in Urumchi. We also met there the local Muslim notables. Along with this he ran an excellent pictorial article on the Urumchi Muslims and added a new bond to the growing Sino-Pakistan relationship. Mir Khalil-ur-Rahman's legacy in Pakistan is the well established Jang Group of newspapers which are published from all the major cities of Pakistan. 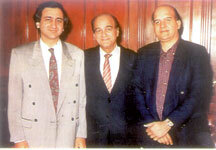 His newspaper empire is managed by his two sons, Mir Shakil-ur-Rahman and Mir Javed-ur-Rahman. Mir saheb personally trained them in the science of newspaper management. As a result, besides expanding the Jang newspaper group, they have added to it a powerful GEO television channel which has shaped into Pakistan's most popular television channel and its programmes can also be watched in the USA and the UK and many parts of the Islamic world. Apart from accomplishing many tasks Mir saheb also served as a Federal Minister in Ayub Khan's cabinet. He commanded an unblemished record of service as a Federal Minister. 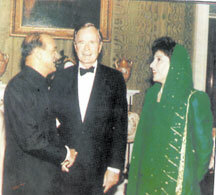 He used to visit his newspaper offices in Pakistan and abroad very regularly. I remember his hospitalisation in 1992 in London where I was then serving as Minister for Information in the Pakistan Embassy. His attending doctors told me that even from his hospital bed he used to make frequent telephone calls to his staff in the Jang London and Karachi to learn how his newspapers were doing. He was very prompt in implementing the awards given by the Government-appointed press Commissions for improvement in the working conditions of employees in the newspaper industry. Mir saheb was a pious and devout Muslim. His newspapers published special supplements on Islamic themes on Fridays and on the occasion of religious festivals. Like the Quaid-i-Azam Muhammad Ali Jinnah, Mir Khalil-ur-Rahman was a liberal Muslim who believed in religious tolerance and sectarian unity. He loved the Urdu language and his newspapers rendered historic services in promoting Urdu in Pakistan. Their use and popularisation of computerised Urdu type-setting and the new print technology revolutionised Urdu journalism and conferred many benefits on the production of Urdu literature and Urdu books.